Snoring and OSA are common problems that can affect your sleep, health and have a significant impact on your quality of life. 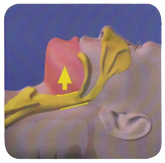 Often snoring is a symptom of OSA, caused by changes in your upper airway while you sleep. Your airway may narrow, limiting air flow as you breathe. Your soft tissue may vibrate (this is commonly known as snoring), or it may completely collapse, causing you to stop breathing. 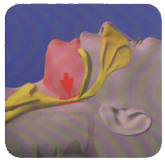 Collapsing of the soft tissue is called an Obstructive Apnea and may last for 10 seconds or more. 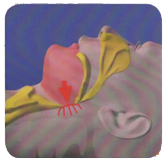 Your airway may even move through all three stages during the night. What can I do if I have one or more of these symptoms? Ask your physician or dentist about taking an Apnea Risk Evaluation Screening test, which involves a simple questionnaire. If you have already been diagnosed with sleep apnea and are having trouble wearing your CPAP, Central Texas Dental Care can work with your physician for your treatment and ongoing care. An overnight sleep study polysomnogram (PSG) is a test that is conducted in a sleep laboratory or hospital setting where the patient has to stay overnight. This is referred to as a monitored sleep study. A home sleep test (HST) can be done using a device the patient wears in the comfort of their own home. 90% of stroke victims also suffer from OSA. Four times more likely to have a heart attack. Twice as likely to die in their sleep and seven times more likely to have a motor vehicle accident. 40% greater risk of having depression. Lifestyle changes: Weight loss, if needed, and an oral appliance are recommended. Oral appliance therapy moves the lower jaw slightly forward and tights the soft tissue and muscles of the upper airway, which prevents obstruction while you sleep. The appliance is only worn while you are sleeping. The radiographic image on the left shows a narrow airway while the image onthe right you can see the appliance slightly protruding the lower jaw and how this movement opens the airway. Most insurance companies pay for a custom-fitted oral appliance. This is billed under your medical insurance, not dental. You may check your policy benefits for custom-fitted oral appliance therapy. Ensure your bedroom is dark, quiet, comfortable and cool. Use the bedroom only for sleep, not television or work. Avoid caffeine within six to eight hours before bedtime. Avoid nicotine. When used close to bedtime, it can lead to poor sleep.